Why not use a threaded insert? That's a good point. First, I'm going to try an easy out. If that doesn't work, I'll do the threaded insert. Craftsman makes a set for $10 that i could use for this, just requires drilling a small hole. If all else fails, I'll just not run that bolt. I'm not in a rush at all to get it done. Might as well try all the options first. Or go to 3/8 which would be easy to find. If you do that, the next owner of this engine is going to haunt you for the rest of your days because he had one odd-sized imperial bolt on your engine. Or maybe I just have a thing about keeping metric things metric and imperial things imperial. Your call. I absolutely do too, that's why I'd rather keep it metric. So far I've got a few choices. Might as well try all 4! I don't wanna get a new timing cover, this is the factory one decked to this block. Plus it's got that nice little dime sized TEQ logo on it. For what it's worth, I had good luck with a heli-coil on the exhaust stud hole I stripped out on my 22R. Might not be enough metal for threaded insert...…….. There is one that's M8*1.25 by 7/16x14 which might work. Mcmaster.com doesn't even have M9 screws. 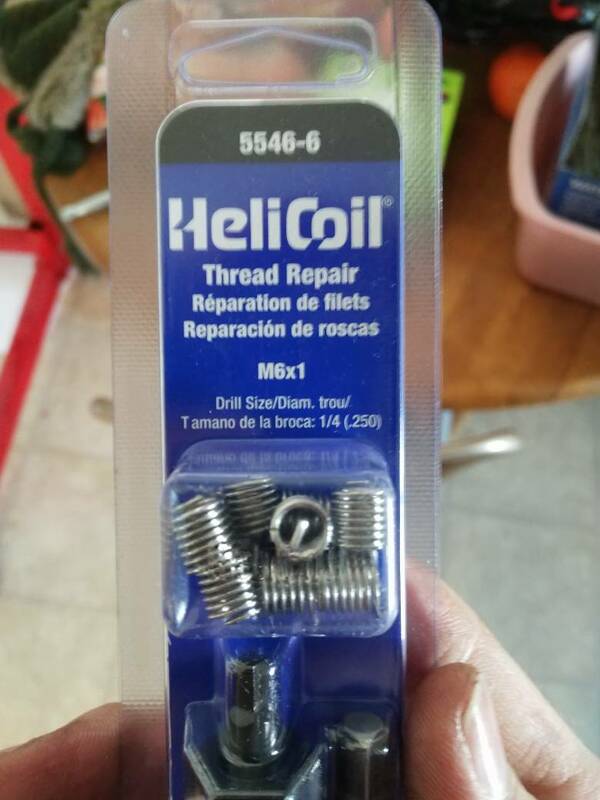 Helicoil's are smaller than threaded inserts, so should be enough metal, but very expensive. Well, it was a stud. I'm basically open to any ideas at this point, I figured I'll try the easy out option first. There should be enough metal. I'm just worried about it getting into the coolant passage if I use anything longer than like a 1/4 inch. You need a good 1/8" Dremel size carbide bit, and good drill bit. Drill bit big enough so carbide bit fits in hole. Drill starter hole in stud remains. Threads in hole should still be good. Love this idea, I thought of something similar earlier but wasn't sure. I'm gonna try a left handed drill bit first. This actually isn't a bad idea, that until the M6 breaks. That's a super small bolt! But, I will definitely entertain this too. You may spend more $$ on whatever you buy to get the broken stud out, 10 times more time messing with it. And in the end it may not be successful. Am I off base with my thinking? because, my timing cover was decked with the block. To a number that I can't remember. The machine shop won't deck the cover by itself as far as I know. It's not that important of a bolt, say it were something else I would. It's quite difficult to have the timing cover decked without the block. I experienced that with my block, which the machinist didn't want to deck, and then decided to deck it without giving me time to run the timing cover down. I was kinda ticked off when he told me afterwards he wouldn't be able to deck the timing cover without redecking the block. This is why I don't wanna do a new cover, I'd have to disassemble everything just to get the block re-decked. If rather spend $30-$40 to get the bolt out, then spend a bunch more on a timing cover. If it was a more important bolt, say the top oil pump bolt, I would. But since it's just this one tiny stud, I'll try everything before I have to get a new cover. Dropped the cylinder head off at the machine shop today, for cleaning/surfacing and a valve job is $250. I believe that included checking for cracks as well. They are pretty busy, so I was told the end of next week. Not a big deal. 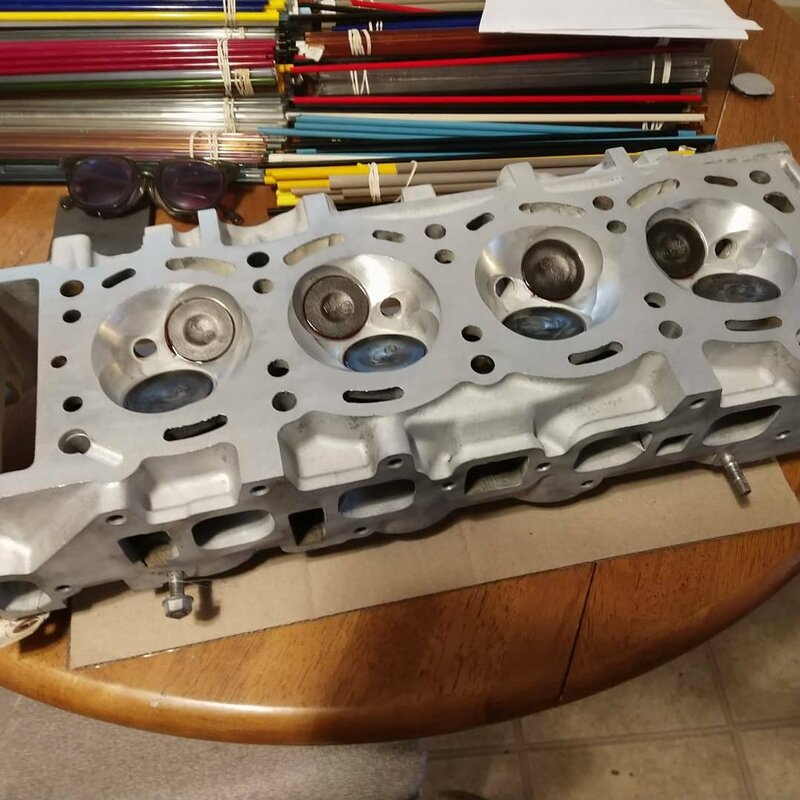 They had a "New" 22R cylinder head for sale, since it isn't a Toyota casting I don't want anything to do with it. It's one of those parts store crap brands. Any bent valves will be replaced as well. Hopefully there isn't any! Forgot to drop the valve seals off as well, looks like I'll be doing that tomorrow. That's what I'm saying. It's a waste of time, money, and valuable deck height have to re deck the block. 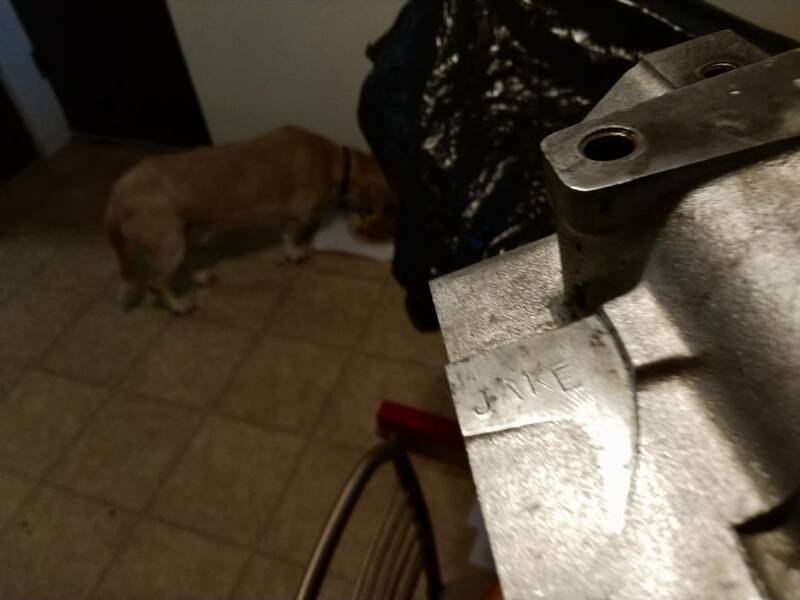 If you messed up the timing cover *somehow*, and you needed to buy a new cover, the way I did it was bolt the unmilled cover to the block, measure height difference with step gauge or similar, and find a competent machinist to mill it. Glad to see your have your project moving forward. $250 is a good price. The number 3 chamber, on stock heads, is where the common crack from the water port to the chamber appears. Any good head shop should look for that. 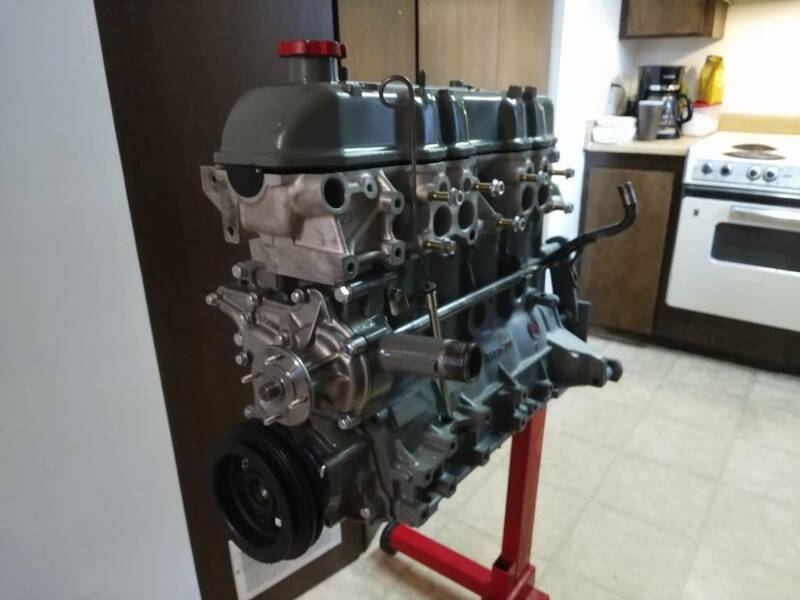 What valves, valve seals, guides, seats, are they going to install? Do they use a specific brand? Also, I’m curious what valve/seat angles they use and recommend? I'd like to know if they deck the head at all, and if they need to, how much did they have to deck it? If they remove anything from the deck, they should measure to know whether or not it may have been previously decked. 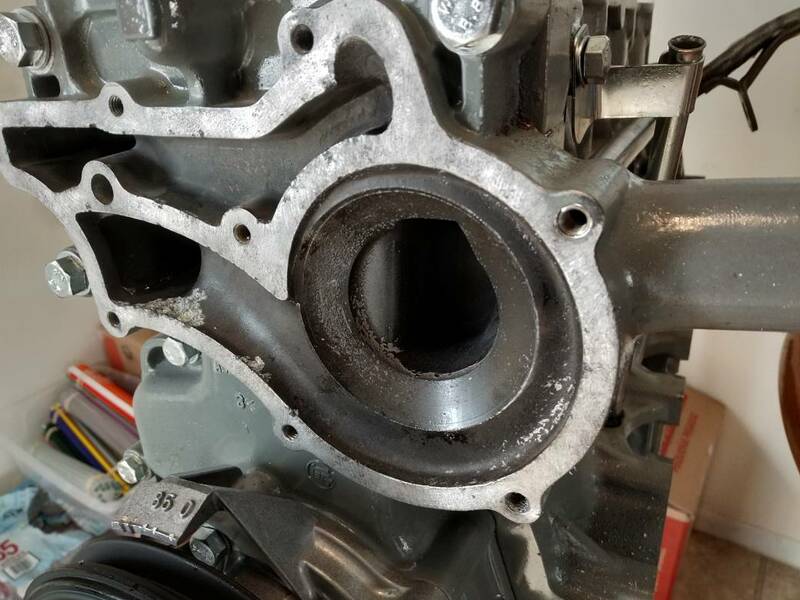 If so, the locating pins will need to be measured (or ground) to make sure their height will not prevent the head from seating down onto the head gasket and block deck. But.... you probably already know this. If you have not already, I recommend that you (or the shop) check the exhaust studs. It’s common for older heads to have studs that will spin inside the head. To help prevent this, I highly recommend NOT using the factory clamp-style nuts. As far as valves, I have no idea what brand they will install IF one is bad. For valve guides, not sure either. They are only going to replace the guides if it needs it. For valve seals, I have the seals that came in my Toyota kit. I bought the complete Toyota gasket kit when I use to work for a Toyota dealer last year. For the exhaust studs, I bought LC Engineerings kit. I also bought their kit for the intake studs too. Every single bolt on this motor is getting replaced. With the exception of the mains and rod nuts. My EGR cooler plate is basically completely plugged, I may buy a new one from Toyota Parts Deal since they are cheaper than anyone else I can find. They have the new oil pump drive spline I need, for like $30. That's half what LCE wants! Pays to shop around, that's for sure. I just dropped the head off yesterday, so if anything is to be wrong I won't hear about it until next week. I am Budgeting $350 for the head, that way if they need to replace valves I won't come up short. I am dropping the valve seals off today (forgot to yesterday) and I'll ask what brand of valves they use. 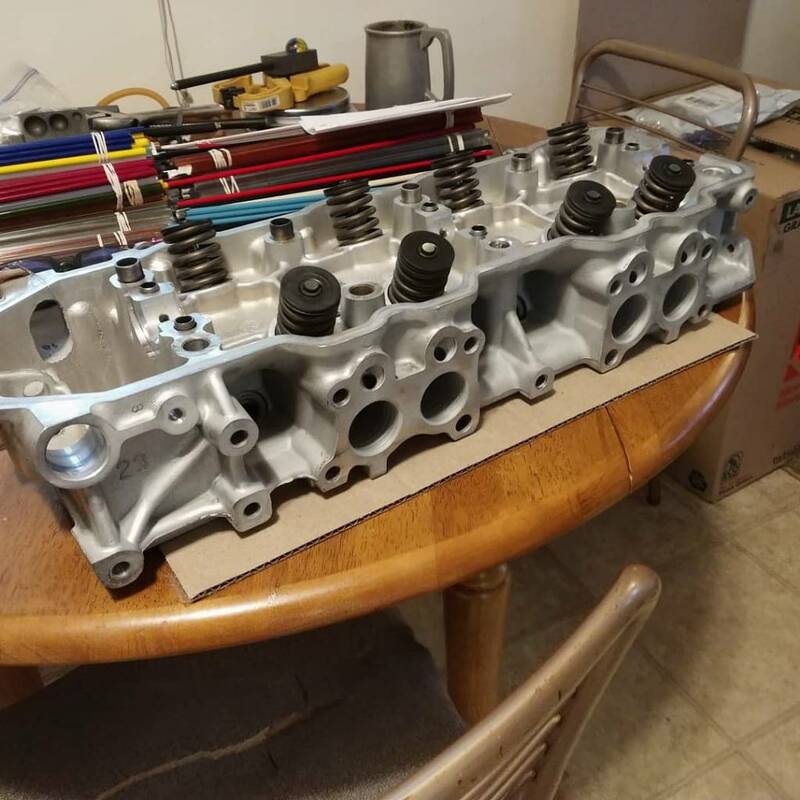 Picked the head up today, ended up paying only $225! They didn't replace ANY valves, they are the original Toyota valves. It only needed a seat grind. As far as the surface, they took .008 - .009" off. The markers on the bottom indicate that it's most likely it's first surfacing. Bad news, I tried removing the intake manifold studs and one broke, I have plenty of room to weld a nut. Before I weld anything, I'm soaking it in PB blaster and I'll hit it with some heat and pliers tomorrow. 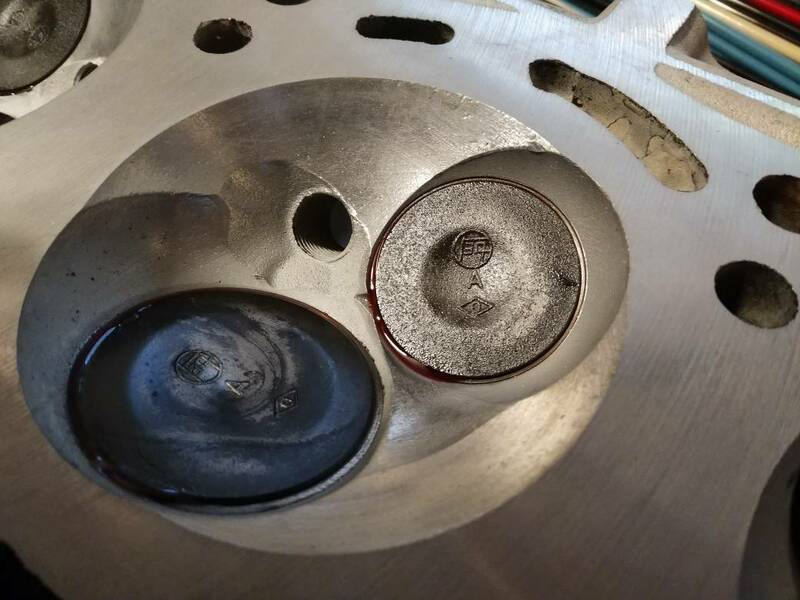 They also cleaned the EGR cooler plate. They also punched my name into the front. So I seem a bit confused about the timing chain, I installed the bright links backwards. The FSM wants the double bright ones up top on the cam marks. I put it on the bottom with the crank marks ( mark pointed down, bright link down). The Woodruff key is pointed up, and the #1 cyl is on TDC. The cam gear marks line up, does this mean it doesn't matter if it's backwards? I mean, if everything lines up properly the bright links don't matter. After all, they change position on the marks every rotation. Awesome, thank you for your meaningful response. Ordered a ton of parts. From 22RE performance I bought a stock re-ground cam, fuel pump drive, and a new oil pump drive spline. From LCE, I bought a complete silicone vaccum hose kit, and a new valve cover to intake breather hose. I also bought the EGR block plates, and the crossover block plate. I bought some new O-rings for the distributor and oil pump drive. And lastly, a new balancer pulley bolt. This thing is gonna look super nice when it's done. To remove the broken timing cover bolt, I bought a Heli-coil kit. I'll drill the stud out and thread one of those in. Since it's not a high torque bolt I have no issue using a thread repair set. Much accomplished today on the build. As some suggested, I used a Heli-coil to fix the broken water pump stud. It Was super easy! 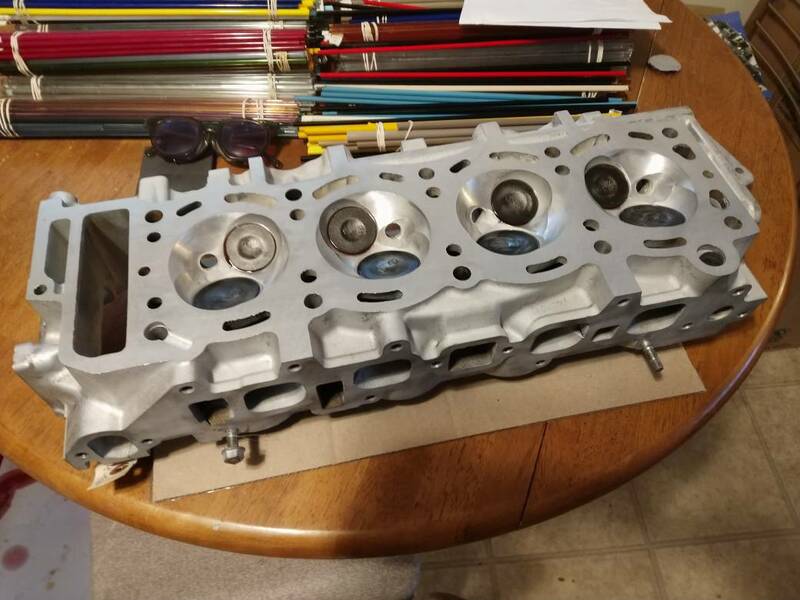 I also set the cylinder head on the block to see how the end product Will look. Man, I can't wait! This week I am having someone help with the broken intake studs, the plan is to weld a nut on. We're gonna use Tig as it's a good process for extracting broken studs/bolts, since you can heat the stud up really hot and add a ton of filler. I'd do it myself but I'm only a first year welding student, and we can't bring our own stuff to work on unfortunately. I'm thinking of painting the head as well, as it would provide a really uniform look. Plus, it'd be child's play to spot a leak! All my stuff from LCE and 22RE performance arrived. Re-ground stock cam, and vaccum lines are among the items ordered. I'm also super excited to completely de-smog this motor, I'll be starting with a complete EGR delete. Cooler plate and everything. I've heard these trucks run best completely de-smogged with a Weber, so that's the end goal. 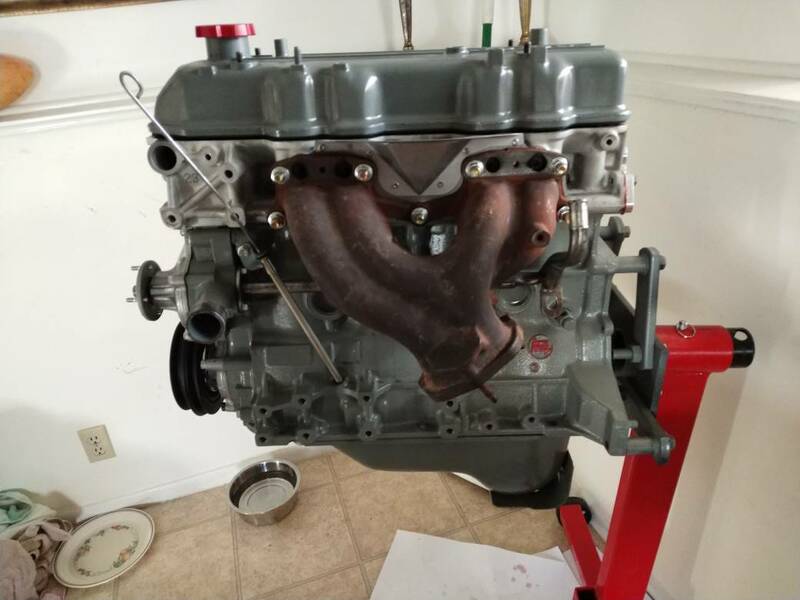 Question, can one completely de-smog a motor running the stock AISIN carb and have it run right? Can't go wrong with a Weber, but I've also heard the stock carbs are great too. Here's how she sits. Tomorrow I'm ordering the clutch kit. Friday the old motor comes out. Head torqued down, rocker assembly rebuilt with resurfaced rockers. Fresh ground cam. Just needs new valve adjusters and she's golden. I painted the pan as well, in the same color as everything else. I wanted to be able to quickly see and spot leaks, if it ever does. I've gotta drill out an exhaust manifold bolt hole, the threads stripped. I'll slap a Heli-coil in there and be done with it.